The grain is fed from a hopper into a "shoe", a wooden trough that controls the flow of grain into the hole in the centre of the runner (top) stone. The grain hits the bedstone and fans out, the rotation of the runner stone forcing the grain outward, between the small gap in the stones. It is here that the grinding takes place, the whole kernel of the wheat ground into flour by the cutting action of the grooves cut in the stones. Three of our volunteer millers, l to r, Moel Benoit, Art Shaw and Chris Wooding receive their miller's certificates from Assistant Curator, Natalie Wood. 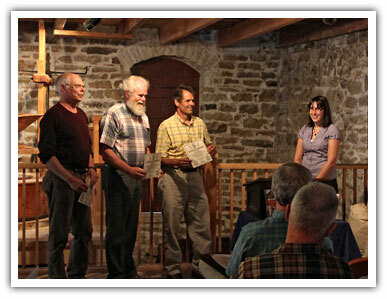 All three successfully complete training on the use of the Old Stone Mill's heritage milling equipment. Listening: for a consistent gentle rhythmic rumble of the mill. Listening for the sounds of the elevator and the bolter to make sure they are accepting and processing the flour. Smelling: for a magnesium / sulphur odour (like when you hit granite with a sledge hammer) indicating that the stones are too close together. Feeling: the flour coming from the millstones between index finger and thumb. With experience a miller can feel when it's just right. Not too coarse and not too silky. An illustration showing some of the components of the millstones. The grain goes into the hopper where it falls into the shoe (a wooden trough, not shown). The shoe is shaken by the horse which is in turn shaken by the damsel. Grain drops from the shoe into a hole in the runner stone and spreads out over the bedstone. The grain is ground into flour as it moves outward until it reaches the edge of the stones. 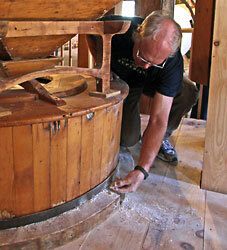 There the flour is trapped between the stones and the vat (a wooden covering for the millstones). The freshly ground flour is moved by the turning stones until it falls into a hole in the floor, leading to an elevator that will take it to the next stage of the process. The operating millstones at the Old Stone Mill. 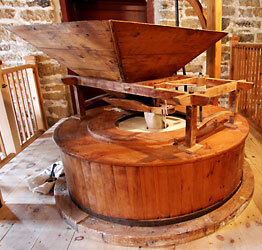 Although not from the Old Stone Mill, this c.1795 equipment operates today much as it the original equipment would have when the mill was first built in 1810. We see the hopper sitting on top of the horse. Under the hopper is the shoe which leads to the a fabric covered drop to a hole in the centre of the runner stone. Setting the runner (top) stone onto the bedstone. Note the furrows (grooves) in the bedstone (there are also furrows on the bottom of the runner stone). 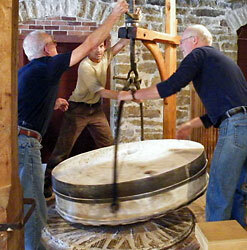 Each of these millstones weighs about 1,200 lbs (545 kg). 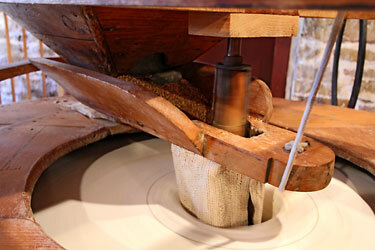 The millstone in our interpretive display clearly showing the furrows (grooves) in the stone. Every so often the miller had to "dress" the stones, making sure that the surface was even (flat) and deepening the furrows to maintain their cutting edges. The stones are known as burrstones (or burhstones) and originate from the Marne Valley in northern France. The stones are made up using pieces of quartz, cemented together with plaster, and bound with iron bands. This type of stone is preferred for grist mills since it is less abrasive than softer stones, cutting rather than abrading the grain, creating a whiter coloured flour. Here we see the grain in the "shoe" (wooden trough) which sits just below the hopper. The "horse" and "damsel" shake the shoe, making the grain fall at a controlled rate into the stones (the light coloured disk under the wood of the vat is the top of the runner stone). Milling is part science, part art. A small access hole allows the miller to feel the freshly ground flour - and based on the feel, the miller will make adjustments to the stones or rate of feed. * Grist: grain ready for grinding into flour at a mill. 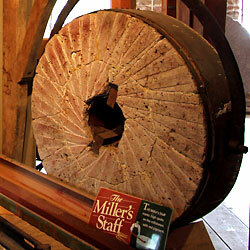 A mill designed for grinding grain into flour is known as a Grist Mill. In more general terms, grist is also known as any material to be processed in a Grist Mill.